This week, I am desperately trying to catch up on some of my outstanding blocks from last month. The first ones to concentrate on….the scrap-bee-licious block. Liz over @ beadqueene asked for a couple of star value blocks. They look great but boy are they small pieces and a lot of them. I didn’t think it would take this long but good news the first one is almost done…..I am sure the next one will be quicker. I hope to have these sent before I head to Nashville this weekend (TWO SLEEPS TO GO!!). More details can be found in her post with the tutorial. 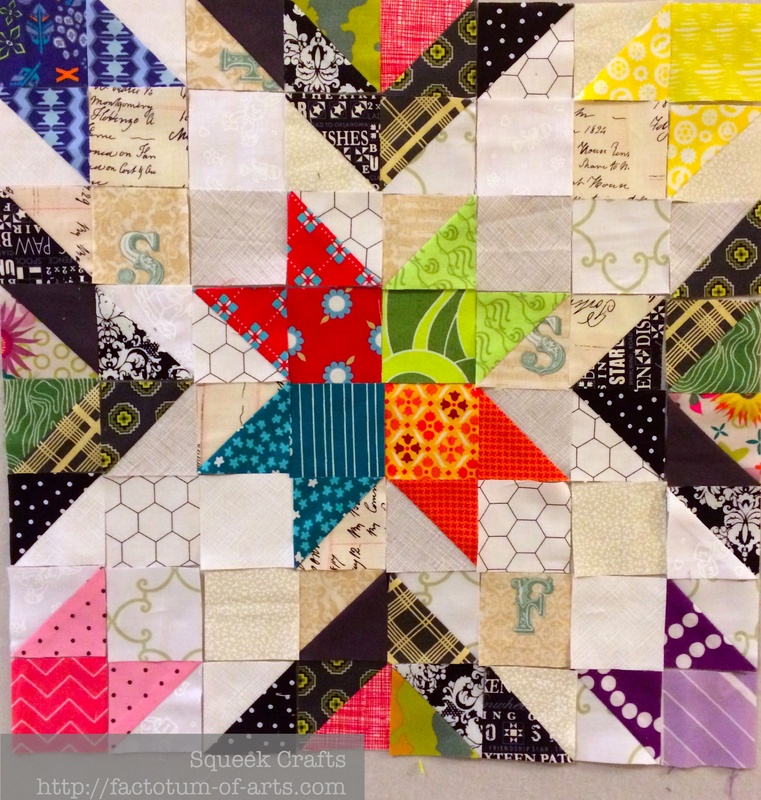 Linking up with Lee over @ Freshly pieced for WiP Wednesday (see button on the right). This entry was posted in Uncategorized and tagged scrapbeelicious, star value block, WiP Wednesday on April 10, 2014 by mlwilkie. Your block looks great! I haven’t made one of those yet! It looks difficult! I really like the fabrics you used! Wow, I am totally impressed with this – love the design and the colors. Your block looks great! That scrappy look is time consuming to achieve – cutting so many different fabrics rather than a bunch of squares of one fabric. It’s so effective though. Good job! I love this block but it is really fiddly. I am glad I only had to make two of them. I just love how this is turning out– the extra work make a really effective design! Great job, looks like a lot of work and the fabrics chosen look fantastic! I love looking at this block. As always, your fabric choices are absolutely stunning! i’m so behind, and this one and i are going to have it out 😉 yours look great! This looks awesome! I just love the prints you used.